The stray dogs were barking loudly, and this barking was unlike any I had heard before. It made me go outside to see. One of the stray dogs had a plastic jar on his mouth like a muzzle and he was not being able to get it off. Clearly he was in a distress situation and that is why the other dogs were rallying around him. This dog must have been scavenging for food in this jar thrown in the roadside garbage heap and while he had been able to push his mouth in into the jar for the food it must have contained, now he was not being able to pull his mouth back out. The neck of the jar was trapping his mouth. The other dogs left within a few minutes. Having realized that they can do nothing to help their fellow being, they went back to meeting the challenges of their own lives. I got out and walked towards the dog. He stood ambling, mildly struggling at the edge of a vacant plot of land. I squatted beside him, and he let me do so. The intention was to catch hold of the jar and pull it off his mouth. The dog’s skin was patchy. He was clearly in a sickly state, even by stray dog standards. I hesitated to take action. I hesitated both because I was reluctant to touch his sickly infested skin and body, and also because of the inherent fear of dealing with a dog, that too right at its mouth. In just two seconds of hesitation, the dog sensed it and started walking away in steady, resolute steps. I rang up my friend Dr. Shubhageetha immediately, asking for help. 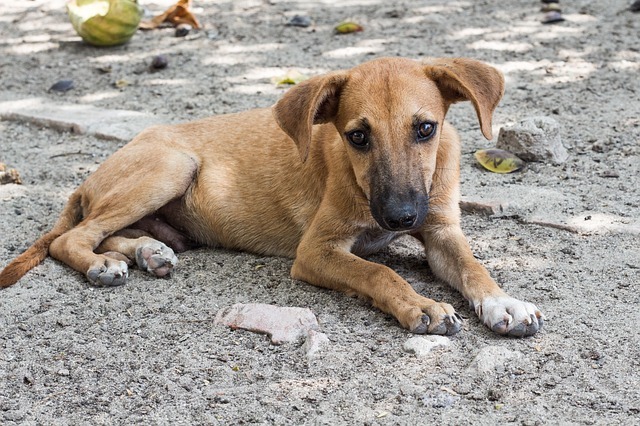 She is a gynecologist who also works actively to help stray and abandoned dogs. It is her passion. I described the situation to her frantically. “Ok, I will come there,” she said. “But he is walking away. I am fast losing him,” I replied. “Keep walking behind him. Do not lose sight of him. I am coming,” she said. So I started following the dog, walking fast, because it had already crossed the vacant plot and was steadily walking down the road towards the valley. Two men on a mo-bike came from the opposite direction. They saw the dog in the miserable condition with a plastic jar on its mouth and laughed. The pillion rider even took out his phone to take a photo. Sensing their ridicule the dog’s pace increased further convinced of this pathetic world where no one cared for him. I shouted at the men, reprimanding them for being so unkind, asking them to stop and help instead, but they had driven off by now. A building was under construction down the road. The workers saw the dog and laughed, pointing to it. Each time the dog received ridicule, its pace increased slightly. It wasn’t running, for it needed to conserve energy, but its desire to get away from this world was stronger, its conviction of being alone was stronger. I was losing sight of the dog though I followed as fast as I could. Frantically, I rang up my friend again. “I am fast losing him,” I said, while I continued to walk as fast as I could. “We are almost there,” she replied. “We have arrived. Where is the dog?” my friend’s voice came back on the phone. “There he is!” she said from her car, spotting the dog going down the hillside. The dog had left the road through the bushes and had almost reached the valley. “Yes, that is the dog!” I confirmed when I too managed to spot the dog on the hillside, but my friend, her husband, and a helper had already turned into the road going steep into the valley and had parked their Maruti just before the next bend where that road vanished away into the fold of the hills. My friend and her helper were there on the hillside, trying to assure and pacify the dog so as to catch him, but he was trying to evade them. Seeing them from the road on top I marveled at how she was sure footed and at ease on the rugged hillside even in a sari and possibly a chappal — testament to having been born and brought up in this region, at home with the terrain and having been on many other such rescue operations. I walked back home relieved that much more competent people were now handling the matter. Later in the evening my friend rang up to give me an update. I was so disappointed to hear that. I wished my friend’s team had, like hunters, arrows dipped in drugs to shoot into the dog and sedate him, so that they could rescue him. Most of all I felt sorry — if only the dog had been able to let go of its fear for a few moments, for right there, just beside its fear stood a much happier healthier life where not only would that horrid muzzle have been removed, it would have received relief and treatment for whatever other ailments his skin and body was ravaged by, and he probably might not have had to scavenge for food anymore, because Dr. Shubhageetha would have found someone to adopt it. That night I went to sleep imagining the dog dying in some dark depth of the valley, weakened by being unable to eat, and still convinced that he is all alone in this world. What finally happened to the dog I do not know, but this is for sure — this incident remains alive in me as a vivid reminder of how we can be so trapped in fear, while right beside us a happy life and a solution for our struggles might be standing, trying so very hard to reach out and help us. Something so very beautiful and exactly what we need for our well-being might be ready for us, but we, blinded by fear are just not able receive it. Even in the presence of fear, it is so crucial and liberating to stop a moment and look around with some tiny degree of faith, softness and receptivity. There just might be an alternative available. There often is.